Cassis is a very pretty waterfront town and considered one of the prettiest on the Cote Bleue in Provence, France in Europe. Travel eastward about 20 kilometers and one will find the waterfront town of Cassis on the Cote Bleue (Blue Coast) in Provence, France. Cassis is one of the prettiest waterfront towns in Provence, and it is more popular with the French holiday crowd than the other busier, touristy towns along the coast. It is believed that the Ligurians were the first settlers near Cassis over 2500 years ago and the ruins of their castle or fort are on the hill Baou Redon across the harbour of Cassis in Provence. Because Cassis is a waterfront town, over the centuries it was always being attacked from the sea by barbarians. During the 18th century life became more secure and the livelihoods of the people of Cassis relied on producing white wine, fishing and quarrying the unique white stone from the nearby cliffs. 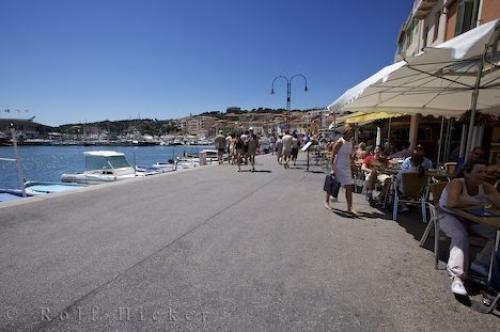 Photo of the town of Cassis along the waterfront on the Cote Bleue in Provence, France in Europe. ... Today, Cassis relies mainly on wine-making and tourism for income and the stone is used for swimming pools, sinks and other residential items. A stroll along this waterfront is like a breath of fresh air and once you have been to this unique town of Cassis in Provence, France, you may never want to leave. Cassis waterfront, Cap Canaille, Bouches du Rhone, Cote Bleue (Blue Coast), Provence, France, Europe.